Polish naleśniki are crepe-like pancakes. They can be made thick or thin. This recipe is for the thicker variety that are very substantial and can be eaten as a main course. 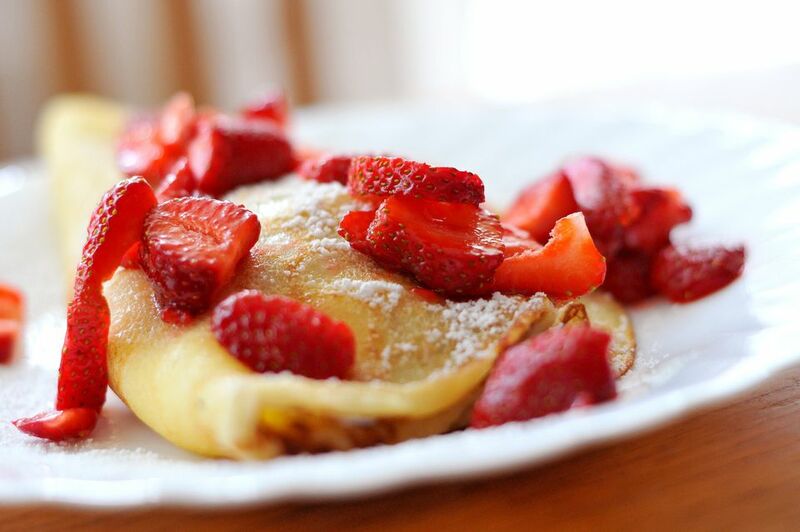 When naleśnik are filled with jam, fruit, or sweet or savory fillings, they are known as blintzes, but the name remains the same in Polish -- nalesniki. Hungarians call crepes palacsinta, Serbs, and Croatians call them palachinke, Lithuanians call them naliesnikai, Ukrainians call them nalysnyky, and in Romanian, it's clatita. In a blender or food processor, combine all ingredients until smooth. Transfer to a pitcher, cover with plastic wrap and let rest for 30 minutes so the liquid can be absorbed by the flour. Using a 2-ounce ladle, portion out batter into a nonstick crepe pan or small skillet that has been lightly brushed with butter. Rotate pan and swirl batter until it covers the entire bottom of pan. Cook until lightly brown or spotted brown on the underside. Turn and cook second side until light brown. Remove to waxed paper or parchment paper and repeat with remaining batter and butter. Serve immediately or wrap and freeze up to 1 month. Place 2 heaping tablespoons filling on each nalesniki and fold the sides in first and then bottom, rolling away from yourself, as for an eggroll or burrito. Filled nalesniki may be panfried in butter or baked in a buttered casserole dish until the filling is set. Some prefer to dip their nalesniki in beaten egg and then in fine, dry bread crumbs, and then fry in butter or a small amount of hot oil until golden on all sides.